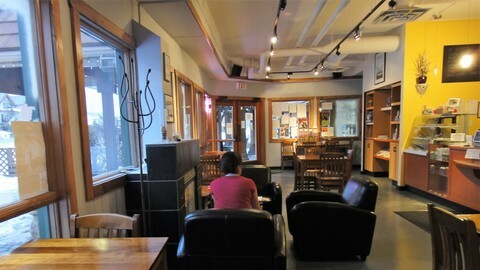 Gourmet Croissant is a neat little place that is on Bow Valley Trail (one of the main roads that runs through Canmore). We went in the early morning, just as it opened on a weekend. It was really quiet in the store, but a nice little comfortable location for sure! I think as we were there soo early, they had nothing ready besides plain croissant and chocolate one. They didn’t have the sandwiches yet or something, but regardless, we ordered ourselves some plain croissants and some hot chocolate. When we first got our croissant, we kind of giggled to ourselves, as it didn’t look flaky or much like anything for that matter! However, as we started eating it, it was really soft, a slight sweetness to the croissant, and it was crispy out the outside too. 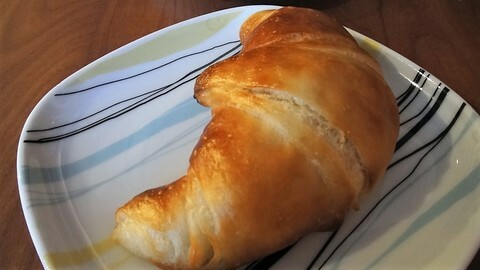 It turned out to be a really good croissant!! So, it is true – never judge a book by it’s cover! We were thoroughly impressed. 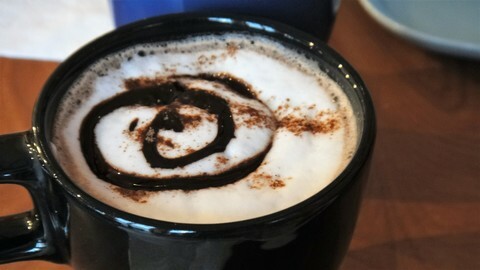 The hot chocolate looked spectacular, and of course tasted good. It’s quite hard to goof up on hot chocolate! 🙂 So, our overall experience at Gourmet Croissant was a positive one. I think I will return, but there are also soo many other great things I would love to try in Canmore! We’ll see! Chinese food at it’s best! I like going here for breakfast, lunch, dinner, and all meals in between! For this particular instance, we went almost as a midnight snack, as we picked up people from the airport on a late flight. Their food is a little greasy, but it makes it look pretty and it tastes good too. It’s not overwhelmed by grease. 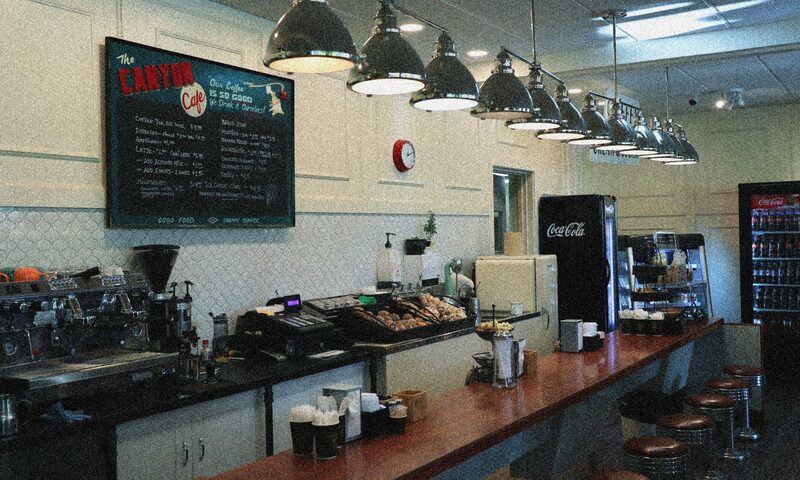 There is a wide array of options on the menu, so I’m sure you’ll find something for any appetite. 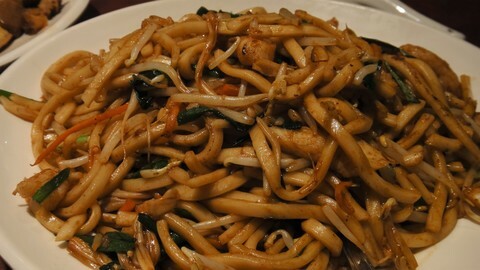 I personally really love the shanghai noodles, but that’s just me and Chinese food. They do an excellent job at making it — but it’s a dish that is relatively simple. 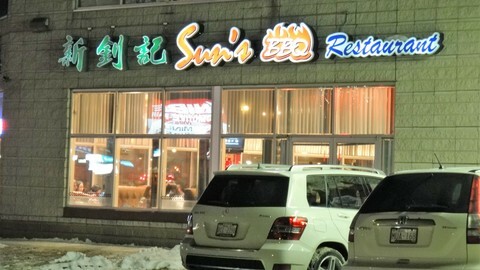 Dinner at Sun Chiu Kee is really good, be sure to check out the dinner review too! O Bistro is a wonderful little place we stumbled upon in downtown Canmore. The service was great, and the food was even better. 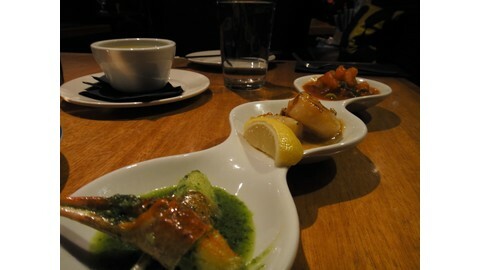 The atmosphere was really nice, and after sitting down, and receiving our drinks, came bread and butter. 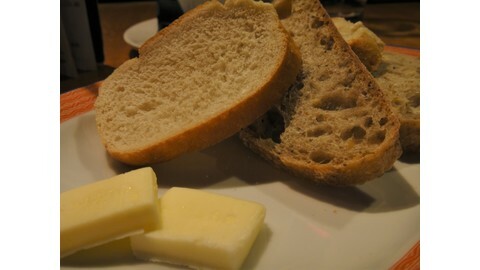 We did munch on some, but it was just bread and butter. We did order a wonderful appetizer – the Seafood Trio with sautéed Prawns Provenìale, seared sea Scallop with honey-braised leeks, steamed Alaskan Crab claws topped with garlic butter. It looked great and tasted even better!! The seafood was surprisingly fresh, and I wouldn’t complain for a second! 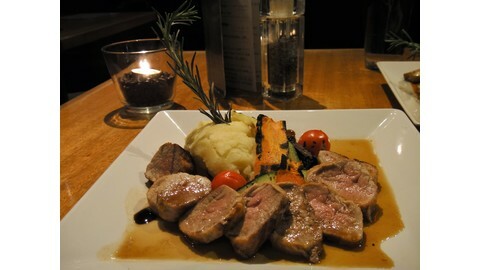 For the main course, I ordered the Ginger Maple Glazed Pork Tenderloin – served with potatoes, market grilled vegetables. The pork was really tender, and the flavour of the ginger maple glaze was perfect. It wasn’t too spicy for the ginger, nor was it too sweet from the maple. It was in perfect balance. 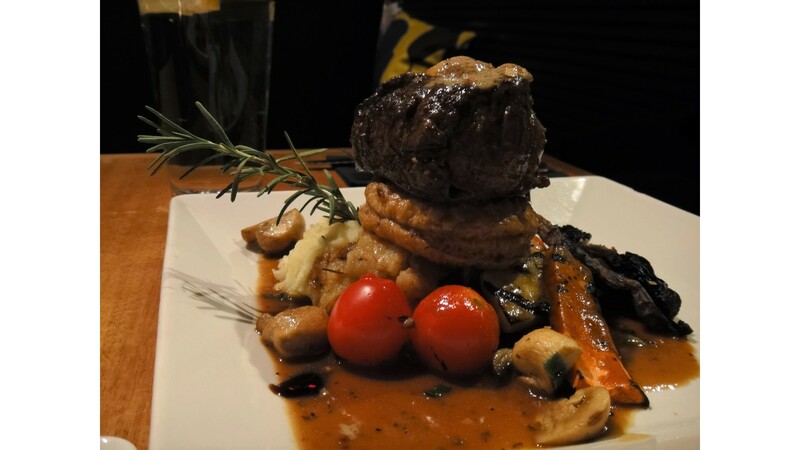 topped with homemade duck pâté & sautéed mushrooms, served with potatoes, market grilled vegetables & Bordelaise sauce. This dish just looked and tasted amazing!! 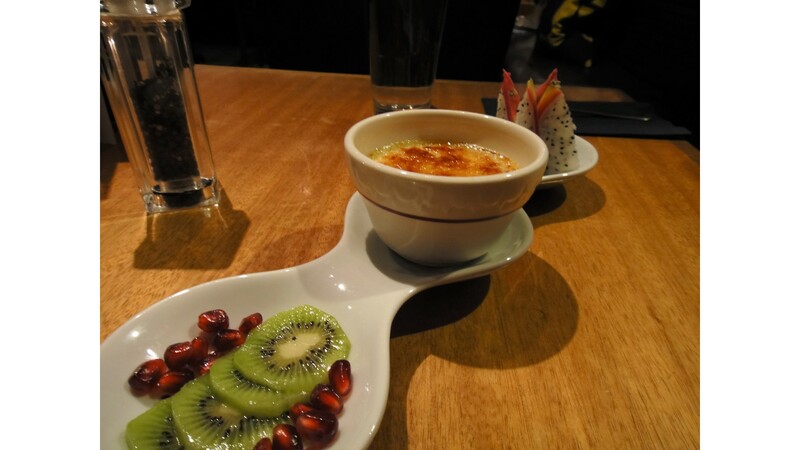 And for dessert, as mentioned, we ordered the special of the day which was a Bailey’s Creme Brulee… which I have no words to describe, besides a big puddle of drool thinking about it! It was the most memorable part of the evening and the presentation is was spectacular! 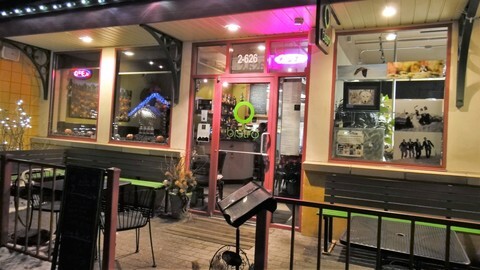 One of the best things about O Bistro is the fact it is a sister restaurant to Chez Francois, which is another favorite of mine! Please, do go try them both — as they offer a very different style of cuisine, and the food is just wonderful. I wouldn’t say the price is much more than other place in Canmore!